This pen surprised me. I didn't know that Zebra was making cheap "disposable" fountain pens. So I bought it. This was the biggest waste of around 4$ in my life. I'm not going to lie I hate the Zebra V-301. First the body. At first glance it seems like a really cool, sturdy aluminum body. However, it feels cheap the moment you touch it. The branding on the pen is large and detracts from the overall presentation of the pen. The cap, which posts with a nice click on the back of the pen, wobbles back and forth and makes you feel like your cap will fall off. These are large problems, but nothing that can't be overlooked. The thing that can't be overlooked is the horrible job this pen does of writing. When I first plugged the cartridge into the V-301 it wouldn't write. So i pushed the cartridge in a little bit harder and it still wouldn't write. I scribbled for about 3 minutes until it finally started writing. Then it stopped writing again. I wanted to scream. I tried doing a writing sample, but got about halfway through it and quit. 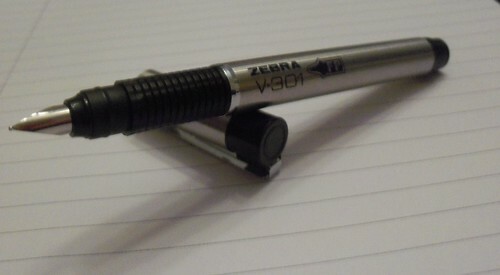 The pen is so inconsitent that I am not quite sure how Zebra can put this out. This is the worst fountain pen, be it disposable or not, I have ever used. I wanted to like this pen. But Zebra did everything in its power to make me hate it. 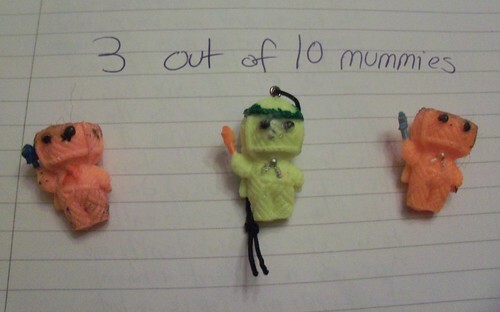 3 out of 10 mummies. i had almost the exact same experience. i've tried cleaning it, using different inks, and nothing makes it better. i want to like this pen, but the inconsistency is really frustrating. one thing that i did try that worked is to turn the nib upside down. for some reason, i get a nice even flow this way, but the line is extremely fine. if you can stand writing with it that way, maybe it won't feel like a waste of $4. 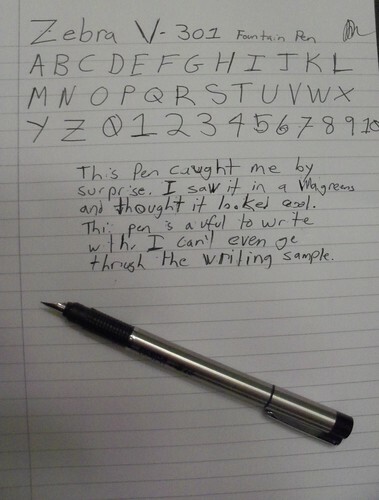 I also tried writing with the nib upside down, however in my case it didn't improve the writing. I don't know if it was just a fluke of manufacturing or what, but this pen makes me sad when I think about it. I bought 2 of these Zebras and haven't had a problem yet. They do feel cheap, but for a sub-$4 fountain pen I guess that's to be expected. The Sailor disposable fountain pens are great, but this one is pretty good if it works better than the batch the Pen swag boys got. It was odd, after the initial scribbling waiting for it to start writing I had about 1 minute of time where it wrote without problem before all of the other problems started. During that time I actually wrote down that the pen wrote very well. I guess I jinxed myself because immediately after it went to hell and hasn't come back. Maybe, hopefully, I got a bad example. I had the same issues at first, then after using it for some time, it works just fine. Took notes with all day with only the occasional hiccup of having to go back over the start of a letter in a string. Jajaja acabo de hacerme de esta pluma en un OfficeDepot aquí en México por $5.5 y tal como les sucedió a Vanessa Hand, instale el tanque de tinta, empece a realizar trazos y la tina bajo casi de inmediato, escribí excelente el primer párrafo pero después de eso... Satanás se apodero de mi pluma y empezo una escritura raquitica. Queria salir corriendo y colgarme en la bañera de mi casa. Eh leído varias reseñas y comentan que este problema, es una constante con esta pluma, pero también para mi tranquilidad comentan que se solventa después de un tiempo de uso. Quizás solo es cuestión de que la pluma se acicale ante a mi su nuevo amo y señor y deje de dar problemas. 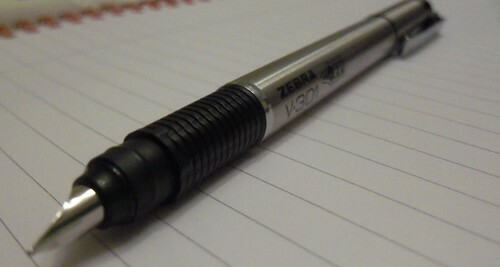 Como la mayoría de ustedes amo los bolígrafos y lapiceros Zebra así que de verdad quiero darle una oportunidad a esta pluma y que se convierta en una de mis favoritas. Hahaha I have just make me of one of these pens in an OfficeDepot here in Mexico for $ 5.5 and as it happened to Vanessa Hand, i install the ink tank, I started to make some strokes and the ink fell from the tank almost instantly, I wrote excellent the first paragraph but after that ... Satan took my pen and began writing rachitic. I wanted to run and hang myself in the bathtub of my house. I read several reviews and comment that this problem is a constant with this pen, but to my relief, people say that the problem is solved after a period of use. Perhaps it is only a matter of time until the pen is acicale before me, her new lord and master and stop giving problems. As most of you I love Zebra pens and pencils so I really want to give a try to this pen and that it becomes one of my favorites. So... Greetings from Mexico and have a nice day. Worst. Pen. I. Have. Ever. Used.